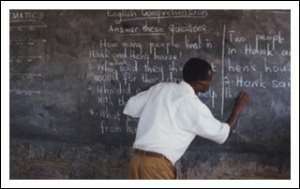 Accra, Nov. 18, GNA - Members of the Ghana National Association of Teachers (GNAT) on Thursday declared that they would not accept the suspension of the payment of their December salaries under any conditions, whatsoever. Mrs Irene Duncan-Adanusa, General Secretary of GNAT, in a statement headed: "GES Workers to Spend Dry Xmas ... Unless 844 ghost names vanish from pay roll" said "we have read with great consternation the story, captioned as above appearing on page 20 of the November 18, 2004 edition of the Daily Graphic." The statement said: "The Ghana National Association of Teachers wishes to state unequivocally that the proposed action of suspending salaries of GES staff for December 2004 is totally unacceptable." It said: "Whilst not condoning the phenomenon of bank rolling "ghost workers", we would not accept the situation whereby the total population of GES employees should suffer for the wicked and unpatriotic actions of a few. "Those responsible for managing the payroll should be identified and made to account for this state of affairs immediately!" The statement said: "The GNAT will resist any action that will bring untold hardship to innocent GES Staff, who have gone about their normal duties diligently and have no hand in whatever is happening between the Accountant-General's Department, the Audit Service and the Ghana Education Service Directorate." It said: "Our hardworking members would, therefore, be expecting their hard earned remuneration on the appropriate payday in December 2004 to avert any undesirable consequences."